So, we have a tradition here at the Peters home where we purchase a new game every Christmas. The hope is to convince all of the family to play it whenever we get together. A couple of weeks ago, I went out to BoardGameGeek to pick out this years game. It was obvious from the first that Dominion was the hottest game out there. So, after reading some reviews and such, that’s the one I chose. It arrived yesterday, and Jenny and I played it for the first time last night. I was not disappointed. There are a couple of things that I thought were especially good about this game. The deck. In the game each player has their own deck. You are adding cards to this deck and drawing 5 each turn to play. The cards that give you victory points at the end are worthless during the game, so you have to be mindful to build a balanced deck so that you can have profitable turns each time. The variety. The game comes with 25 kingdom cards. But, you pick just 10 of them to use each game. These kingdom cards give you the actions that you can perform during your turn. So, the game is very high in re-playability because of the many different combinations of kingdom cards you can chose to play with. 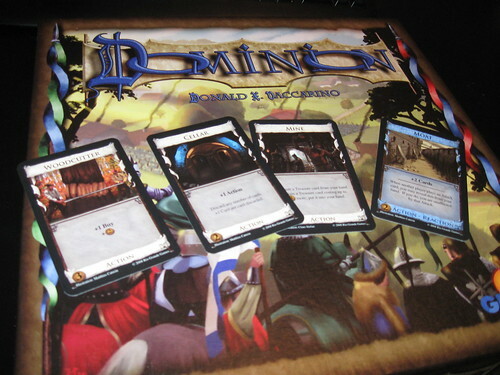 So, if you are looking for a new game to play with family or friends, I highly recommend Dominion. Jenny and I had a blast playing it, it was very easy to learn, and we wanted to play more as soon as we were finished. Next postSo, where have you been?